West African nations are struggling to contain the deadliest Ebola epidemic in history. The outbreak has infected more than 3,500 people since March. At least 1,800 of those have died. Liberia has suffered the greatest number of deaths. UNC students and faculty have created a tool to help government and health organizations make quicker and better decisions to stem the outbreak. 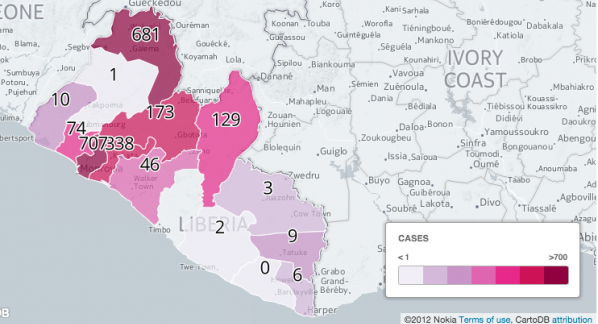 A team of UNC staff and students have designed a website to help visualize the spread of Ebola in Liberia. Among the countries most affected by the Ebola virus is Liberia, a small country on the coast of West Africa where more than two thousand people have been infected, and almost half of them have died. Thomas Karyah, a government worker for the Liberian Ministry of Information describes the atmosphere from the country’s capital, Monrovia, now the epicenter of Liberia’s outbreak. A severe lack of medical resources is the main challenge the Liberian government faces in containing the outbreak. With a population of 3.5 million, the country has only 200 doctors, and the government can’t build medical treatment centers fast enough to treat the growing number of infected people. But, officials at the Liberian Ministry of Information say access to more current data on the spread of Ebola, and clear presentation of that data, could help government officials and health organizations better decide how to allocate limited resources. “It’s one thing to have data, it’s another thing to comprehend it and to know what to do with it,” Steven King, a professor of interactive media at UNC, said. King is one of several partners the Liberian ministry reached out to for help creating an effective way to present data on Ebola infection and death rates. This month, King led a team of ten UNC students and recent graduates to code and design a web application that displays important numbers in easy-to understand-visualizations. The app can be viewed on any computer or mobile device connected to the Internet. King pulls up the website on a large flat screen in his darkened office on UNC’s campus. A map of Liberia appears, divided into several regions in varying shades of red. The darker the hue, the more cases health workers have reported. King moves his cursor over the map.“As you roll over it, you’ll be able to see both color changes as well as the numerical value,” King said. The map and the numbers showing the rates of infection will automatically update when health workers in the field send the number of infections and deaths to the system through a technology called “SMS,” better known as text messaging. Right now the web app uses numbers from the World Health Organization, but once workers start using the SMS system, getting Ebola data to the government should be much easier and faster for healthcare workers. Right now, Karyah says workers face hurdles in making health reports. “Some of them had to drive through difficult terrains to come to the capitol to send their reports with the SMS component the entire process with be smooth and time saving,” Karyah said. Karyah says people are already using the app, including government workers and Liberian media outlets. The app also has information on infection prevention and the latest Ebola-related headlines. Karyah hopes ordinary Liberians with internet access will use the app and spread information to those who can’t get online about which areas are affected and how to protect themselves against the virus. But even though Karyah views the data project as a success so far, with the current rate of infection, he finds it hard to be optimistic about his country’s ability to stop the epidemic any time soon. “We cannot see the end to this. We are trying our best to cope with the situation, but there’s no endgame in sight,” Karyah said.